Complete Loveland auto repair – no misleading coupons or gimmicks, just quality, honest service. The best way to maintain your vehicle’s life and ensure its reliability is to have regular maintenance and repairs performed on your vehicle. This includes oil changes, muffler inspections, brake inspections, and factory recommended maintenance. At Hawker’s Auto Repair Shop in Loveland, we have the experience and tools to keep your car running smoothly for years to come. Hawker’s Auto provides auto shop repair services in Loveland and Fort Collins: Brakes, Mufflers, Tune-ups, Suspension & Steering, Factory Scheduled Maintenance, Oil Changes & Lube, Free Pre-purchase Inspections, Clutches, Electrical repair, Custom Exhaust, Coolant & Transmission Service, Fuel Injector Cleaning & Service, RV Service, CV & U Joints, A/C Recharge & Repair, Window & Door Lock Repair, Shocks & Struts. We now offer Hail Damage Repair, Paintless Dent Repair and Door Ding Repair. If you’re looking for a one-stop auto repair shop in Loveland, then come to Hawker Auto Repair. We can handle all your drive train needs including transmission, clutch, and CV and U joint services. We also provide free inspections for brakes, suspension, and steering to make sure that your vehicle is always ready to perform at its best and keep you safe. Although we are a full service auto repair shop in Loveland, we specialize in mufflers and exhaust systems. We offer customers both stock replacement, as well as custom built systems. In addition, we can do complete electrical repair, window and door lock repair, and A/C repair. Hawker’s Auto is also registered as an Air Care Colorado repair facility if your car has failed an emissions test. Whether you need an oil change in Loveland or your check engine light has recently come on, our team can perform maintenance to keep your vehicle running smoothly and reliably all year long. For Loveland Auto repair, mufflers, tune ups, oil changes, timing belt replacement, RV repair, and servicing; Hawker Automotive is your one-stop shop. We now offer hail damage repair, paintless dent repair and door ding repair as well. 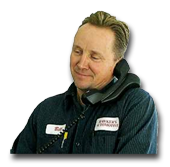 Bill Hawker has over 35 years experience taking care of your auto repair needs. Copyright © 2017 Hawkers Automotive and Economy Mufflers | Loveland Auto Repair Mechanics servicing N. Colorado, including, Fort Collins, Windsor, Wellington, La Porte and the surrounding areas.